Have you been thinking to buy 10 Meter CB radio all night? Has its ‘outclass’ power output bewildered you in freezing winter? Did you take it as just one of CB’s kinds? Let me tell you that there is a big difference between a 10-meter radio and a CB radio. Yeah, both are not the same! It’s time to think right and we will help you out in this regards. What makes both these radios different? Well, the key difference between the two lies in the band itself. They operate on different frequencies and provide different channels. The rules set for this radio are different and demand critical operational knowledge. 10-meter radios are also known as Amateur radios, whereas CB radios are 11 meters. Nevertheless, these 10-meter radios offer powerful ranges giving you a unique experience. The products offering support in this should be bought wisely. These great products will dunk you into incredible radio adventures. But, the bottom line is that you will never get 10 meter CB Radios in the market. However, you can get them separately- as a 10 meter one or as a CB radio! If you really want to check out the difference between the two, check it out from this article. We have tried to cover the difference in depth. If you’re someone who wants to dig deep, you should read ahead. Let’s understand a few things before buying the radio. It is important to understand their outcomes and requirements. Changes in power output as accelerated by 10-meter radios have a greater impact. We’ve drawn the line between CB radios and 10 Meter Radios. Walk through the following points to have essential insight prior to purchase. These limit the bad radio experience and subsequent remorse. Require License: 10 Meter Amateur Radios need a license to operate them. The reason is their power output exceeding maximum limit for CB radios. You need the authorization to indulge in longer ranges resulted from high power. High Power Damages: You need to be fully aware of the risks of using 10-meter radios. We’ve outlined this point to favor the health of radio and gadgets enthusiasts. The high power exhibited by 10 Meter Amateur Radios can result in dangerous possibilities. They demand careful usage because of their potential to damage soft tissues. They may also damage different organs if not used appropriately. This is one of the reasons why these require licenses. The users must accustom rules and must know how to operate. Distortion: The thing with 10 Meter Radios is that they can disturb other signals. That means they’re capable of overpowering other communications. It’s significant to note they can swath important communications as well. For these facts, you need to focus on reasons for buying 10 Meter Radios. These high power radios are good for great output power if your requirement isn’t just 4 watts. Let me tell you it once again. 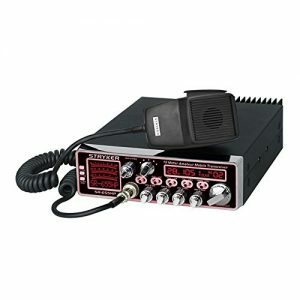 If you’re looking for a CB radio, we have already reviewed our top picks in this website itself. You can find it here: top CB radios by CBRadioGuru.com. I really hope you have understood the difference between the two. If so, let us see what are the top Amateur radios. We’ve decided to bring two greatest 10 Meter Radios to your screen. Read the reviews below to hunt down them. The Stryker SR-655 is a 10 Meter Amateur radio. It exhibits high power up to whopping 70+ watts PEP. You can thank four FQP13N10 MOSFET transistors aiding to this top quality Amateur radio. This is one of the best CB radio from the Stryker brand. This PC programmable radio sponsors 32-position Dimmer control and advanced clarifier. Not just these, it also provides VFO, variable power, and variable talkback control. This 10 Meter radio offers you amazing LED backlit face place. You can browse through seven colors for favoring your choice. The push button or a CPU controller’s scanning let you do this job. The controls are front-mounted. What’s even more exciting is ‘Six Roger beeps’ feature. Discard your awkward confusions with this ‘end-of-conversation’ notification. Stryker’s outstanding receiver protection system is invaluable in crowded transmissions. This exclusive feature rejects adjacent channels in areas of high power operators. No wonder it showcases optimum performance while engraving its worth on market. The second one on our list is from the famous Connex. It is Connex 3300H; a Ham Mobile Transceiver. The radio has a blue LED channel display with a small-scaled meter. You will love using the radio. It is one of the easiest to use radios out there. The display and meter provide you easy readability on long drives. You can catch its glimpse for checking signal strength and power output. The radio has two modes, FM or AM. This device guarantees 10W maximum power output and 50+ Watts PEP. Dual finals feature is a steady result. You can also control your power output level with Hi/Low radio functions. Transmission/reception mode is indicated by RED/GREEN LED. Communication signals are clarified from statics or noise by ANL and Noise Blanker. Safely cruise around the town without caring about external noise interceptions. Radio has established ‘Echo Board’ having two controls. One for controlling volume while other for the amount of delay. External frequency counter can be easily installed with the addition of an external jack. The radio offers outstanding range and can be heard miles away. Excellent for truck drivers waiting for their partners to command over channel 19. This rugged 10 Meter radio is great for off-road missions as it remains affixed. The radio lands on your home with an easy-to-use feature. Works great on just a reasonable budget. You need to take it to the shop if you wish to convert it to CB. I know that you are not satisfied with our reviews. Yeah, we are CB radio experts and not Amateur radio specialists. Let me honestly tell you something. We couldn’t add all those great ten meter radios in this article. But, there are plenty of other good ones. Some of the top 10-meter radios are Galaxy DX-2517, President Lincoln, and Stryker SR-89MC. Surfing through online stores will also help you find plenty. However, you also need to run after some at the earliest. They’re vulnerable to being sold out soon. You will have to understand that 10 Meter Amateur radio does not carry the name CB with it. You need to get a license for legal operation of this type of Amateur radios. It is susceptible to damages if carelessly handled. However, you can still dive into great radio experience with authorization and high-quality radios. Before I wrap up this article, there is something more I want to tell you. Yes, you can use the ten-meter radios as CB radios. But you need to convert them. 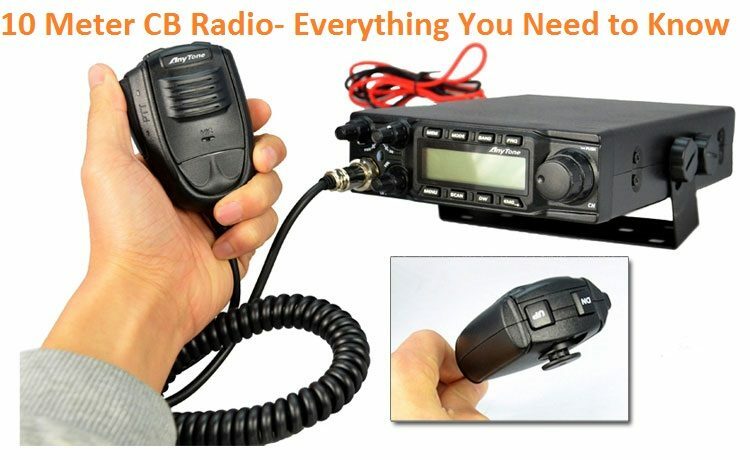 There are many 10-meter radios to CB radio conversion services available in your nearby CB shops. You should definitely check it out. With little bit customization and tweaks, you might get a good CB radio. Next time when you hear someone asking what are the best 10 meter CB radios in the market, tell them there is nothing as such. You will never get a ten-meter radio and an 11-meter radio together in this world! However, you have the options to go for either a 10-meter amateur radio or an 11 meter CB radio.